What’s crazier than finding a long-lost twin? How about a long-lost triplet? 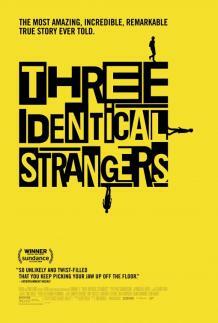 With a story so bizarre it can only be true, Tim Wardle’s documentary, “Three Identical Strangers,” tells the tale of three young men who discover they’re actually identical triplets separated at birth. But what begins as a light and fluffy, too-weird-to-be-fiction story goes unimaginably deeper, stranger, darker. It’s best to go in as cold as possible, to try (and likely fail) to guess what comes next, and to prepare for a wild, twisting nonfiction ride.